Weekend breakfasts in our house are a big deal. During the week between work and the créche, we don’t get to have breakfast together so Saturday and Sunday breakfasts’ are very special. We’ll usually have two courses-aren’t we good to ourselves?!? I’ll usually have a smoothie or some yoghurt, my husband and daughter will have cereal and then we often treat ourselves to these pancakes. With just two ingredients, they are super healthy and super quick! 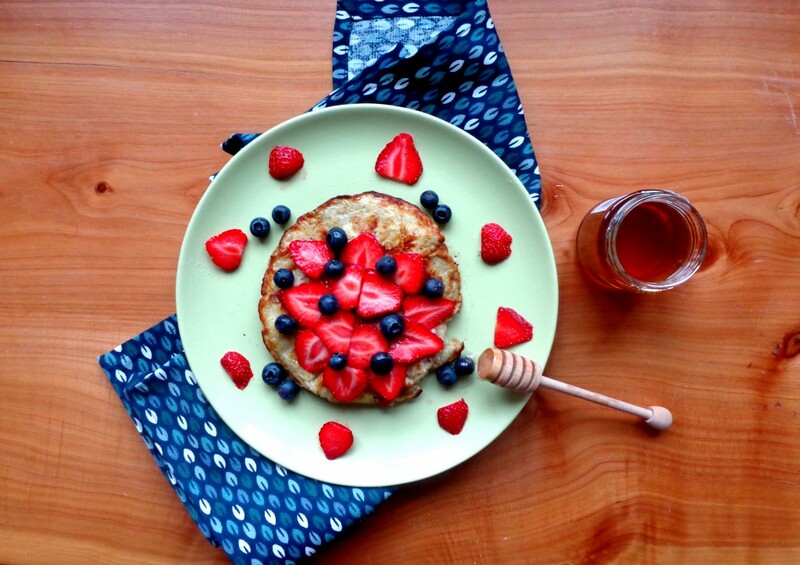 My daughter loves them especially with the addition of the fresh fruit and raw honey. Our honey comes from 8 km away in Dripsey, Co. Cork-about as local as it gets! Before I go any further I must make a confession. I’m not great at flipping pancakes. It has never been my forte. So I cheat for this recipe. I don’t flip them. That is because after a few failed attempts to flip and my daughter Ciara screaming “Where are my pancakes Mommy?” I decided I would cheat by cooking one side first then cooking the other side under the grill. Pancake puritans might not be impressed but hey nobody is perfect. Preheat the grill to 200°C/400°F. Beat the eggs together in a bowl and mash the bananas with a fork. Combine the eggs and bananas in a bowl and mix well using a whisk or fork. Set a frying pan on a low-medium heat. Melt one tablespoon of butter in the frying pan and pour one half of the mixture in. Allow to cook for a few minutes until the eggs start to cook and turn golden brown around the outside. Using a metal spatula, have a look at the pancake underneath. If it is still a very pale colour, continue to cook for another few minutes. Once the pancake has started to firm up, place the frying pan until the grill and continue to cook until the pancake is golden brown and cooked on the top. Transfer to plate and top with fresh fruit and raw, local honey. Repeat for the other pancake and enjoy! How to cook courgette/zucchini noodles – You’ve been doing it wrong all along!